In my many years writing here on TVGB, I don’t think I have reviewed something that simply seemed like a no brainer to buy…until Utomik. Utomik is a super awesome (and super affordable) online videogame library. For only $6/$10 a month, you get access to an ever growing collection of videogames, new(ish) and old! Think of it like a Netflix for gamers. You simply scroll through the library games and if you find one that looks fun just click “Play” to begin downloading it. It’s that easy. Utomik adds up to 30 new games each month and you can cancel anytime, but why would you? 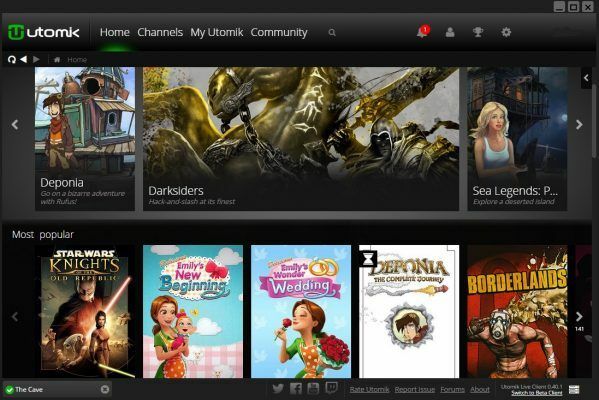 Utomik’s goal is to allow gamers to play as many games as they want, with just one click. A cause as noble as that deserves at least one day’s worth of lunch money don’t you think? Or two Starbucks coffees? Four packs of gum? I could go all day. Bottom line is, Utomik’s value is absolutely amazing. The newest game I found was from 2015, so it can’ t compete with Redbox or Gamefly when it comes to brand new releases. But it makes up for that with its price and selection. 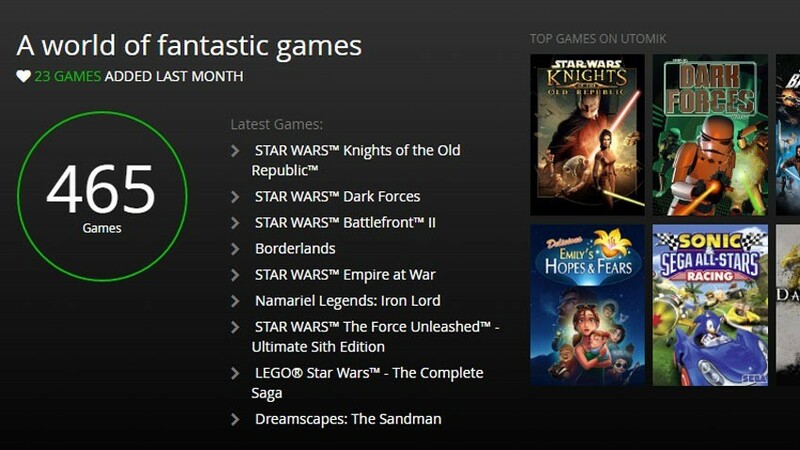 Some of their most popular games include: Alpha Protocol, Darksiders, Deponoia, Evoland II, Red Faction: Armageddon, Sonic the Hedgehog 4, Stars Wars Battlefront II, Star Wars: Knights of the Old Republic, Strong Bad’s Homestar Ruiner, The Walking Dead: A Telltale Games Series and The Cave. The Utomik client’s home screen. You know those games that begin updating or installing but have a “playable” section marked on the download status bar? That’s kind of how Utomik works. Once you find a game you want to play in the ever-expanding library, Utomik downloads just enough of it on to your computer so you can begin playing almost immediately. The rest downloads as you play. This allows Utomik users to skip a lot of the usual waiting periods associated with playing new games, I.E. long install times, updates, patches, etc. This download method also gets rid of any potential quality or lag issues as players are simply downloading a full game (at its original quality), similar to how they would on Steam. Speaking of quality, Utomik’s interface is super simple and easy to understand. It looks and functions very similarly to Netflix, with a little bit of Steam thrown in. By simply hovering over the game’s cover art, you can select “PLAY,” which will cause the game’s immediately download. You can also choose to visit a game’s profile page. 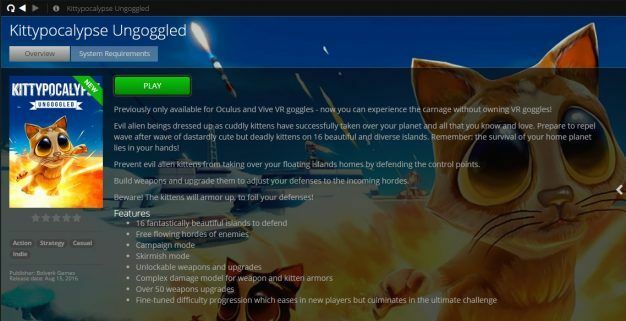 This profile page reminds me of a game’s “store page” on Steam. It’s here where you can read a game’s description, watch its trailer, and find other information such as its original release date, ESRB rating, key features, genre…the list goes on. It’s your go to resource if you have questions regarding the game you’re about to play. While it wouldn’t be fair to pit Utomik against the next-gen console streaming services PlayStation Now and Xbox Game Pass, it can hold its own against Red Box, Game Fly and even Steam. A game from Red Box cost $2.99 a day. Just that one day is half the cost of a Utomik subscription. Game Fly, which is probably Utomik’s biggest competitor in terms of services offered, is much more expensive per month and the games may lag while you’re streaming them. As for big daddy Steam, you have to buy everything you want to play. Utomik only asks for $6 a month to get access to its whole collection. Utomik may have a funny name but there’s nothing funny about it’s service! You can begin a FREE 14-day trial today just for signing-up. Give it a try and experience the joy this unique gaming platform offers. This review is based on a free trial provided by Utomik.